100% Pure Wisconsin Ginseng cultivated with over 4 generations of knowledge. With names ranging from Firepits & Flannels to Pinups & Paramours, the products from this 4th generation family farm will have you wanting to try them all! DEET-free mosquito repellent with fun, wearable options! Collagen is essential for healthy bones, joints and skin. Find out why you might choose to get extra in your diet with a collagen supplement. Dating as far back as 400 BCE, activated charcoal has been used to purify water, and research suggests it may support total body cleansing due to its highly absorptive properties. Activated charcoal is a natural internal detoxifier, popularly used to help cleanse the body of unwanted materials. 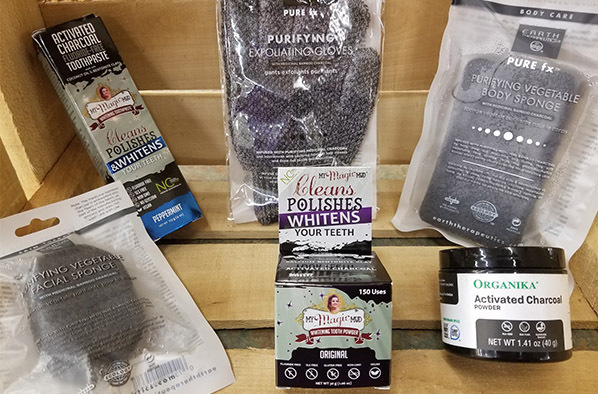 We also carry options containing activated charcoal in many of our personal care products including toothpaste, body and facial scrubs, cleansers and masks. Diffuse on-the-go with natural lava rock bracelets. CBD is short for cannabidiol, a phytocannabinoid found in the cannabis plant that has been increasingly found to have benefits on human and animal health*.